In early January 2014 the Independent Institute of Socio-Economic and Political Studies (IISEPS) published its December 2013 poll results for various domains of public opinion. Though some people, including opposition politicians and activists, doubt this institute's ability to handle a proper social survey in an unfree society, most Belarusian experts and analysts trust their data. The results of the latest poll suggest that Belarusians show certain signs of a gradual "maturing" as a society. In the economic realm respondents tend to be pessimists, blame the government and the country's ruler for its failures and show high demand for market reforms. When speaking of foreign policy, more and more people prefer the EU to Russia and support the authorities when they clash with their eastern neighbour. At the same time, the support rate of Alexander Lukashenka have fallen, but the opposition did not manage to gain any points from it. The IISEPS poll indicated a further deepening of people’s pessimism with the state of the economy and the prospects of their own welfare. Almost 69% of the respondents agreed that the Belarusian economy is going through a crisis. The numbers have worsened since the previous IISEPS survey, which was conducted in September 2013 (57% that time). A considerable 12% pessimistic shift in the numbers can be explained by salary growth freezing at the end of the year, the authorities’ plan to cut budget spending, several rather doubtful governmental fiscal initiatives that were recently announced (like auto-owners tax, $100 exit-fee and "sponger-tax"), a gradual devaluation of the national currency etc. The number of people awaiting the situation to worsen further has become nearly three times higher than the number of economic optimists (36% vs. 12.5%). When asked who is responsible for the crisis and whom they rely on to resolve it, Belarusians came up with the following responses. On whom do you rely in overcoming the crisis? Blaming the head of state and government for the crisis represents the majority’s immunity to the state propaganda, however, combined with a certain amount of paternalism – they maintain hope that Lukashenka and foreign countries will play a key role in overcoming the crisis. Of all the results of the survey, what appears to be most surprising in a generally paternalistic Belarusian society is the number of market reforms supporters has reached 60% (46% among those who trust Lukashenka). These figures, meanwhile, can deceive because the history of market transitions in other post-soviet states shows that the reforms’ support falls after people feel the first painful consequences which inevitably accompany any economic liberalisation policy. All in all, the ongoing failures of the Belarusian "socially-orientated" economy has people disappointed with the government and has them beginning to recognise the need for changes and market reforms in particular. The poll also confirmed another trend continuing: more people prefer EU to Russia if asked about with whom it would be better to integrate. 45% have chosen EU, while only 37% – Russia. What would you prefer: Uniting with Russia or entering the EU? At the same time, 45% agreed that Belarus should change its policy to become closer with the EU, with only 22% disagreeing with this position. One further result that can be derived from this issue seems quite surprising: 39% claimed they do want to see more Russians coming to live in Belarus (only 24% held the opposite view and 33% held no position one way or the other). Analysing this data, one must take into account that Belarusians are generally known as a tolerant nation, most of them speak Russian. Moreover, full freedom of movement became one of the most notable, if not the only achievement of so-called Union State of Belarus and Russia. Belarusian authorities enjoy rather high approval rate with regards to their stance in the latest conflict with Russia (known as the "potash war"). Only 13.6% blamed Belarus for starting the conflict and only 25% disapproved of the arrest of the Russian potash giant "Uralkali" CEO Vladislau Baumgartner. As the years go by, the number of pro-European Belarusians gradually increases, while the number of pro-Russian ones continues to decline. This remains true despite all the anti-Western propaganda in the state media, the officially announced course towards Eurasian integration and the vast annual economic benefits being reaped in from Russia. So, one could only guess what the situation will be given these factors cease to exist in the future. The decline in support and trust in the Belarusian ruler was another unexpected result of the December poll. Both figures have shown relatively stable growth for the last two years (after the 2011 economic crisis). Do you trust current president? What concerns the electoral support rate, less than 35% of Belarusians would have voted for Lukashenka in December 2013 (after 37,3% in June and 42,6% in September). The primary reason for this decline is, naturally, the government's economic failures. As was demonstrated in the first paragraph – people tend to blame the country's leader for the crisis. The swift increase in the figures from September occurred right after a particuralry active phase of the above mentioned potash war. Insofar as public opinion was generally positive with the Belarusian government's actions in this conflict, Lukashenka, praised by state TV as a fighter for sovereignty and national dignity against insidious Russian oligarchs, gained some points. With three months having already passed, the "nation's defender" image has faded. All of Lukashenka's problems with public support contribute little to the opposition's own popularity. Support rates for opposition leaders do not go any higher than 3% except for two ex-candidates for the presidency: the head of civil campaign "European Belarus" Andrei Sannikau (3.2%) and a poet Uladzimir Niakliaeu, leader of "Tell the truth" campaign (7.1%). Aleh Manaeu, the head of IISEPS, in one of his latest interviews explained Niakliaeu’s relative success by the "Tell the truth" strategy to concentrate their activity on pertinent social issues. Many other opposition structures choose to promote a purely political and human rights agenda, which remains unpopular among most of Belarusians. Thus, even the aggregate rate of all the opposition leaders remains far behind Lukashenka’s own declining figures. Moreover, trust in the opposition parties in general (16%) appeared to be lower that the level of trust to KGB (34%), courts (35%), police (35%), the Central Election Committee (32%) and even to the utterly passive pro-government political parties (20%). As always, the IISEPS poll reveals a wide range of public opinion trends, which seem difficult to summarise in a single unified conclusion. In general, Belarusians, against all the existing odds, show signs of slow maturing as a society: appreciating their sovereignty more, detecting the government's fault in the economic crisis, striving more for European integration and market reforms. Unfortunately for the opposition, its leaders fail to be in tune with people, often proposing them an agenda too divorced from their actual needs and ideals. On the 6th of January the ice hockey team of the Belarusian president, again won annual Christmas International Tournament of Amateurs for the Prize of the President of Belarus. The tournament was to demonstrate the complete readiness of Minsk to host the IIHF World Ice Hockey Championship which will take place in May. Much as in years past, state TV broadcasted Alexander Lukashenka showing perfect physical form while playing hockey. Many amateur hockey players from all over the world spoke openly to state media of the outstanding organisation of the tournament. The show concluded with the giving of medals and titles to the presidential team's players. From first glance ice hockey may seem as an innocuous hobby of an eccentric authoritarian ruler, the same as cigars for Fidel Castro or Saddam Hussein's penchant for writing romance novels. But Lukashenka’s passion for ice hockey costs millions of Euro of budget money annually. Over the last fifteen years, the Belarusian leader constructed 26 indoor ice arenas whose maintenance is too expensive for the frail Belarusian economy. Alexander Lukashenka is no stranger to fitness and is known to exercise regularly. According to the web-page of the Presidential Sport club “The President's team is a unique team where ice hockey veterans and young people, former professionals and amateurs, and the leader of the country and regular citizens are able to play side by side”. But in reality most of the players playing at the side of the country's most important athlete are ex-players of either the national team or professional ice hockey players from leading Belarusian clubs. It should come as no surprise then that the President's team hardly ever loses. Throughout its history the team has won numerous friendly matches and eight out of ten Christmas tournaments. Even the regulations of the annual Christmas tournament provides Lukashenka's crew a privileged status that other teams do not receive. In contrast to the other teams, six professional hockey players are allowed to be part of the team's lineup. Obviously Lukashenka is a big fan of his own team. After their latest victory at the annual Christmas tournament he awarded his teammates with state awards which were previously only bestowed upon Olympic medalists and outstanding athletes such as Victoria Azaranka. This decision provoked a lot of banter by sport fans on the Internet. Renowned Belarusian independent journalist Sviatlana Kalinkina criticised the president's hand-picked team. She compared them to a service staff and declared that amateurs like these, whose main job is to just entertain Lukashenka, should not be awarded some of the most prestigious honours in the nation. Lukashenka openly speaks about ice hockey in his interviews. In a press-conference with leading Belarusian media held on January 21, he brought up the topic several times. He criticised the Dynamo-Minsk ice hockey club, which performed poorly in the Continental Hockey League. As a result the club's director, Aleh Ivanou, resigned. Then Lukashenka mentioned the Christmas tournament and said that he decided to give awards to his teammates to encourage professional players to achieve better results. 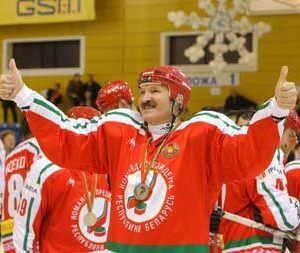 Finally Lukashenka mentioned The World Ice Hockey Championship which Minsk will play host to in May. According to him, it is crucial that all aspects of the tournament will be impressive for all of those in attendance. He stressed that there should not be any empty seats at any match of the tournament. Most likely this means that schoolchildren and students will be forced to visit matches to fill out the picture of TV broadcasts while simultaneously helping to break all previous attendance records. The Belarussian president also uses hockey as an instrument to improve relations with Russian political elites. On 4 January in Sochi he played on the same team as Vladimir Putin and Russian ice hockey stars against Russian officials and businessmen. Naturally the Putin-Lukashenka team won 12:3. It is difficult to overestimate the importance of ice hockey in Belarussian politics. The officials heading the Belarusian Ice Hockey Association belong to the inner circle of the president. 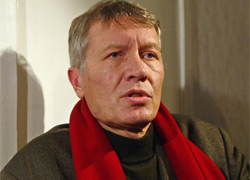 For a long period of time (from 2001-2009) the Minister of Internal affairs Uladzimir Navumau headed the association. The ex-minister of sports and the deputy secretary general of the Eurasian Economic Community Yaugeni Vorsin stepped in to fill his shoes back in 2010. Most of the arenas are erected as an individual project and come with a hefty price tag. To build the Minsk Arena – the main arena of the World Ice Hockey Championship – the state budget spent around $350 million. The second major arena for the tournament is the Chyzhouka Arena which came with a price tag of $189 million. Doing a brief comparison, one can see how exorbitant these figures are. To rebuild the Steel Arena in Košice (Slovakia), which hosted The World Ice Hockey Championship in 2011, it would cost only €27 million (or about $37 million). Arenas on the regional level have also become quite a burden on the state budget. The “Ice Palaces” in Orsha, Babruisk and Baranavichy cost between $ 20-32 million a piece. After an “Ice Palace” is built, the budget must set aside money to maintain the arena, introducing new burdens to fragile local budgets. After conducting a little investigative journalism, the independent newspaper “Salidarnasć” reported that to maintain these “Ice Palaces” the budget must spend millions of dollars annually. The irony is that none of these arenas are profitable, nor likely will they ever become so. For example the Minsk-Arena cannot earn much money by renting out its facilities. The “Dynamo-Minsk” hockey club playing at arena do not have to pay rent thanks to a presidential decree. Average Belarusians playing hockey in these “Ice Palaces” bring in very little in the way of revenue for the arenas. Outside of Minsk, in the regions, “Ice Palaces” are never going to be able to earn significant money from events such as concerts. It is not like either Madonna or Elton John have any plans of playing in these venues, nor will they. In addition these ice hockey arenas have to pay the hundreds of employees working at the facility. As a result, the Belarusian tax payers must subsidise these impractical arenas to keep them afloat. The right to host IIHF World Ice Hockey Championship is a great achievement for the regime. Inside the country the event would legitimise the “Ice Palaces'” construction and the sports policy of Belarus in general. The tournament will also be a great opportunity for the Belarusian authorities to make a huge PR campaign towards transforming the negative image of Belarus in the West. Not only the elites, but also average Belarusians will have an opportunity to benefit from the tournament. Surely small businesses and taxi drivers will not miss the opportunity to earn money on tourists while the authorities, for their part, will ensure that Minsk will become a friendlier place for foreigners.